Successfully Added TFT LCD Projector - 1080p Support, 5.8 Inch LCD Panel, 2800 LED Lumen, 200 Inch Image Size, 6M Projection Distance, 155W LED to your Shopping Cart. With this 5.8 Inch TFT LCD projector, you’ll be able to give presentations and watch movies like never before. By producing up to 2800 LED lumens, this LCD projector is capable of displaying bright and vivid images in any dark room. 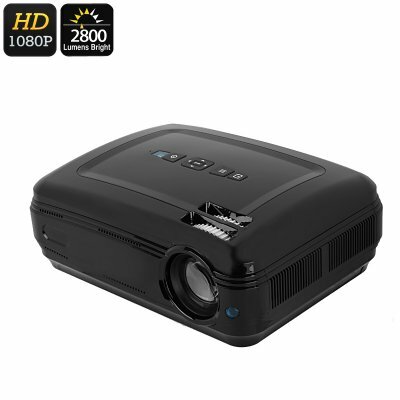 Whether you use it for business or entertainment purposes, this FHD projector is sure to meet your demands. Thanks to its high range of different inputs that include HDMI, VGA, AV, USB, and TV, this projector brings along great usability. With a projection distance ranging from 1.1M to 6M, this electronic gadget is suitable for small rooms and large offices alike. This LED projector supports Full-HD 1080p media files. Thanks to this, you’ll be able to turn any room into your private cinema. Simply connect it to your laptop, PC or TV and project the movie of your liking onto your wall. This LCD projector supports image sizes up to a massive 200 Inches, letting you enjoy a truly cinematic experience. The next time you invite over some friends for a movie night, you’ll be sure to blow their mind with this stunning LED projector. It supports both 4:3 and 16:9 aspect ratios. This means you’ll be able to watch both traditional and modern wide-screen media without losing any of its quality. With its 155W lamp, you can be guaranteed that you’ll be treated with bright and stunning visuals at any given moment. Whether you’ll use it to give presentations or watch a movie, this TFT LCD projector is sure to uplift your media experience. This projector comes with a 12 months warranty, brought to you by the leader in electronic devices as well as wholesale electronic gadgets..